Permajet Win Best Professional Paper… AGAIN! PermaJet take home the award for Best Professional Paper for the 6th year. 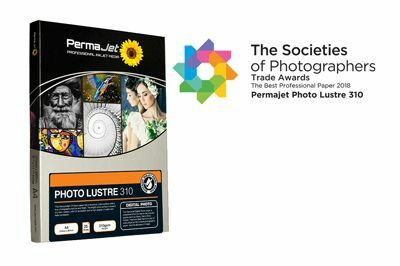 Voted for by the public and presented by The Societies of Photographers at their prestigious trade awards evening in London, PermaJet was awarded Best Professional Paper 2018 for Photo Lustre 310. Launched just 10 months ago, Photo Lustre has already made its mark on the photographic and print industry, celebrated by the success of this award. Also nominated for Inkjet Media: Photographic Finish in the Photography News awards, PermaJet are heading for a home run in 2019 with this inkjet paper. With a robust 310gsm base, luxurious lustre surface, and a high Dmax that produces incredibly rich blacks, it’s easy to see why Photo Lustre is fast becoming a favourite. Its suitability for a vast range of images combined with its beautiful appearance and high-quality feel – yet remarkably affordable price – are what make this media an obvious staple for any digital printers stock. To see this award-winning paper demonstrated in person, visit PermaJet at The Photography Show Stand F91 or visit www.permajet.com to place an order online.